When ordering a new, ugradeable EUROCOM M5 Pro, customers can receive a free display upgrade to the 15.6” 4K UHD 3840x2160 Samsung display panel by ordering a system configured over $2000. This allows customers to spec-out a really powerfully capable system and get rewarded with a free ultra-high resolution display upgrade. “We are rewarding our customers who choose to order a EUROCOM M5 Pro performance configuration by giving them a free display upgrade to 4K. Amazingly, we are offering a free 6 million pixels to these customers from a mere 2,073,600 pixels to an astounding 8,294,400 pixels, which amounts to a crystal clear viewing experience.” Mark Bialic, Eurocom President. At Eurocom, choice and upgradeability are paramount for our customers. They demand the best and they demand the ability to choose between varieties of high quality, high performance components. Customers can now choose between a total of six display: two 1920x1080 panels in the AUO B156HAN01.2 matte, LG LP156WF4-SPU1 Glossy, one 3K WQHD 2880x1620 PANASONIC VV16T029D00 matte, and three 4K panels in the Samsung LTN156FL02-L01, SHARP IGZO LQ156D1JX01B Glossy and SHARP IGZO LQ156D1JW04 matte panels. The EUROCOM M5 Pro supports beautiful 15.6-inch 4K 3840-by-2160 displays as well as a FHD 1920-by-1080 displays. The high pixel density of the 4K display with 8,294,400 pixels provides extremely detailed images for true to life content. Eurocom also offers professional colour calibration services to ensure every one of those 8 million pixels are accurate as possible. 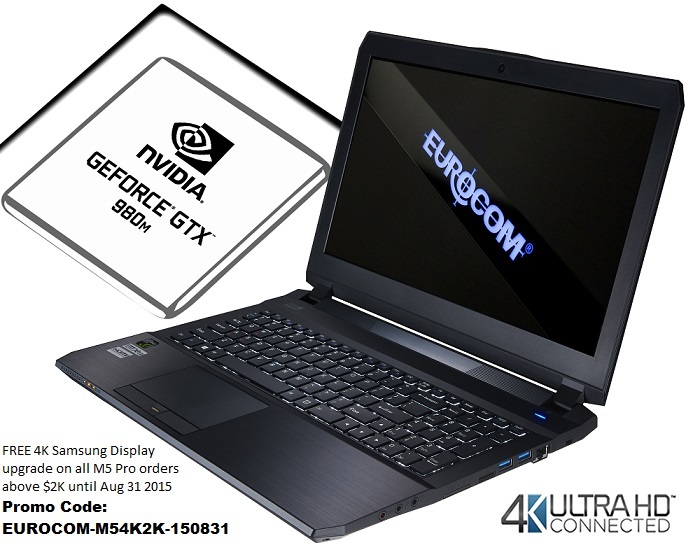 To power this multitude of pixels the EUROCOM M5 pro supports both NVIDIA GeForce GTX 980M (4GB DDR5), GTX 970M (3GB DDR5) and 965M (2 GB GDDR5) graphics for unbeatable performance, raw power and great battery life. The EUROCOM M5 Pro has two M.2 2280 SSD, SATA interface (RAID 0/1) or One M.2 2280 SSD PCIe Gen2 x2/x4 interface, as well as two changeable 2.5” 7mm(H) HDD/SSD (RAID 0/1), or One changeable 2.5” 9.5mm(H) HDD/SSD, SATA interface. The abundance of storage options gives customers an incredible amount of control over their storage capacity, speed and price. Upgrading the storage and memory on the EUROCOM M5 Pro is so easy Hardware Canucks recently created a video doing just that, here. The EUROCOM M5 Pro has an Intel HM87 Express Chipset running the Intel Core i7-4710HQ processor with 4 cores, 8 threads running at 2.5 GHz with integrated Intel® HD Graphics 4600. Due to Hyperthreading, the four cores can handle up to eight threads in parallel leading to better overall utilization of the CPU. The i7-4710HQ is rated at a TDP of 47 W including graphics card and memory controller. The Intel Core i7-4720HQ and Intel Core i7-4870HQ are also offered, to provide customers with the processor they need for their requirements. Cannot be combined with other offers. Available until August 31 2015. Available while supplies last.